The popular Potty Toss game will have everyone giggling before the event begins. 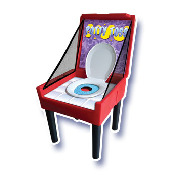 Participants will throw the balls into the potty to win. Comes with 3 plastic balls.